Formed in January 1953, the Paragon Cycling Club is still comparatively new, but in the few months that have passed, really great strides have been made. A cycling club does not fulfil its aim if its policy ends with the Sunday club run or the occasional time trial, and so the policy of the Paragon has always been a very wide policy, to cater for all types of cyclists…the leisure cyclist, the club cyclist and the racing man, with the accent on friendship and sociability. There is for the use of members, a centrally situated club room where many enjoyable evenings can be spent, where the members get together to spend a social hour or two, to have a chatter, to play some of the games such as darts, draughts, monopoly, chequers and billiards, or just to sit and read over a cup of tea or other refreshments. In fact, the clubroom is the hub of all the activities of the club, with occasional meetings when the members can speak for themselves to put forward their requests and suggestions. About the club runs themselves – these have been formed to suit each particular type of cyclist…for the leisure cyclist there is the Social Section leaving about mid morning, and lunching within a radius of 15 miles of Scarborough. Then there is the General Section as its name implies, catering for the general cyclist or ordinary club rider. The meal stop is for this section usually about 30 miles distant. The General Section also invariably stops for tea. This is the most popular run and always has good attendance. There is a further section called the Hardriders Section, which is composed mainly of the racings members, and is usually impromptu. Several races are held by the Paragon Club throughout the year. Amongst the social events held by the club are dances, pie suppers, freewheel contests and others as requested. Yes, there is always something going on in the Paragon – come and see for yourself. The club room is behind Rose’s Cycle Shop in Gladstone Road – is open every Monday, Wednesday and Friday at 7.30pm. Drop in for a pleasant evening, or try one of the club runs (times etc in the Saturday Evening News), you’ll be sure to join and the subscriptions are so very low. All it costs for a year’s membership is 6/- for seniors and 4/- for juniors up to 17 years of age. And so whatever your age, male or female, whether you cycle 10 miles or 100, join the PARAGON and enjoy cycling at its best. Re-typed from copy of original document by Elaine Ward 28/02/13. Author believed to have been Ken Atkin (General Secretary from the 1950’s) as a promotional piece. 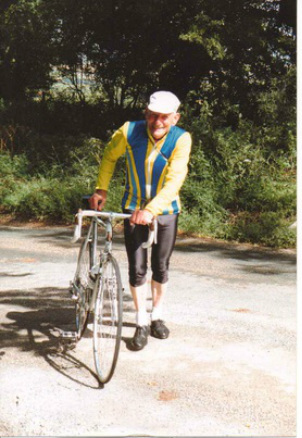 Here is Stanley (Stan) Chadwick in his later cycling days. Stan is one of the founder members of the Club, along with Dennis Bielby & Ken Atkins, present at the very first meeting in January 1953 of interested parties when the Paragon was established in Scarborough. In 2013, his 97th year, Stan remains our Honorary Life Member and President and gets frustrated that he cannot take a more active role in club activities. However, he still managed to attend the Club's Annual Dinner and Prize Presentation in February 2013, the club's 60th Anniversary. Stan also remains a fountain of knowledge to draw from. Further historical notes will be featured on this page taken from lengthy discussions and interviews with Stan, based on his recollections and experiences over the years. The above photo was taken in the early 1950's and kindly send to us by Brian Gough, an early member - do you recognise anyone? You should know the dapper man on the left. Location was the Scarborough football field and grass track meeting where donkey derbys were also held.